So, yesterday's bento was a complete hit! All of Kidlet's buddies loved the Bakugan and the best part of all: The box came home completely empty. He ate every single bit and wasn't hungry after. Woo! It can be difficult with a growing boy to know how much food is enough so I was very happy to have struck the right amount on the first shot! 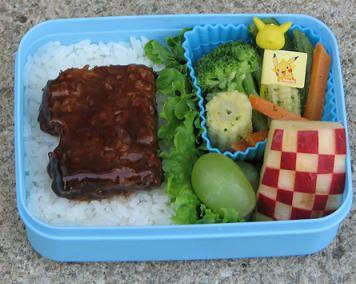 Today Kidlet got one of his favorite combinations in bento. A Morningstar Farms Riblet on top of rice with mixed Asian flavored vegetables, grapes, and checkered apple. All in his brand new Pokemon box that I failed to get a picture of the lid to. It's been a hectic morning.